I was honored to be present as Metro Nashville Mayor David Briley on today signed the Equal Business Opportunity ordinance into law. 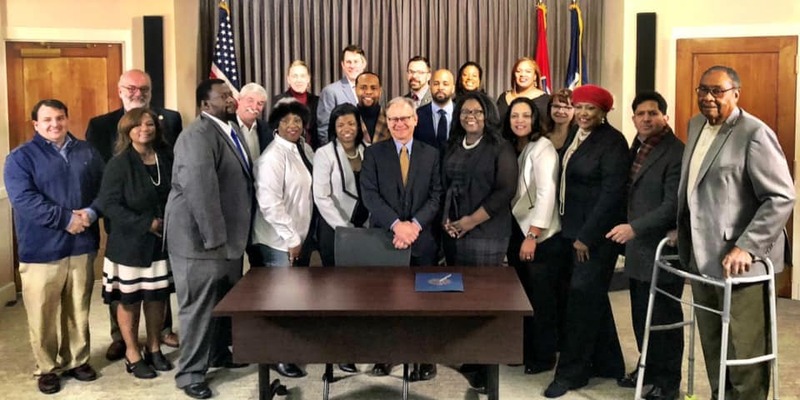 The law establishes the Equal Business Opportunity Program and require Metro Nashville to – among other things – implement race and gender conscious subcontracting goals, based on market availability, for all public contracts. This is a significant departure from the current ordinance, which allows for a race and gender neutral subcontracting program. Councilmember Tanaka Vercher, along with Councilmembers Sharon Hurt and Scott Davis, sponsored the measure. In addition to the ordinance change, Mayor Briley announced in November the Small Business Reserve Program. This program allows Metro-Nashville to unbundle select public contracts to allow small businesses to compete for contracts on a tiered basis. Under the Small Business Reserve Program, small businesses – regardless of the owner’s race or gender – will compete for select projects based on size, scope, and capacity. The small business initiative will not require Metro-Nashville Council approval. These policy, programmatic, and procedural changes come on the heels of Metro Nashville’s most recent disparity study. The study found that the city’s procurement processes discriminated against women and minorities in its awarding of public contracts. It also found, among other findings, that women and minority businesses were underutilized in public work.